High-Heeled Foot in the Door: Weekend Recap: Lion & Tigers & Jewels! Hope you all a great weekend! We had quite the adventure on Saturday. Turns out that the Cabelas store in CT didn't have what Jon was dying to pick up so we headed into PA instead. Turns out it was around the same distance as the CT location so away we went. I was a bit bummed that I couldn't go visit any of the places some of your recommended, but the birthday boy was on a mission. What was the mission? 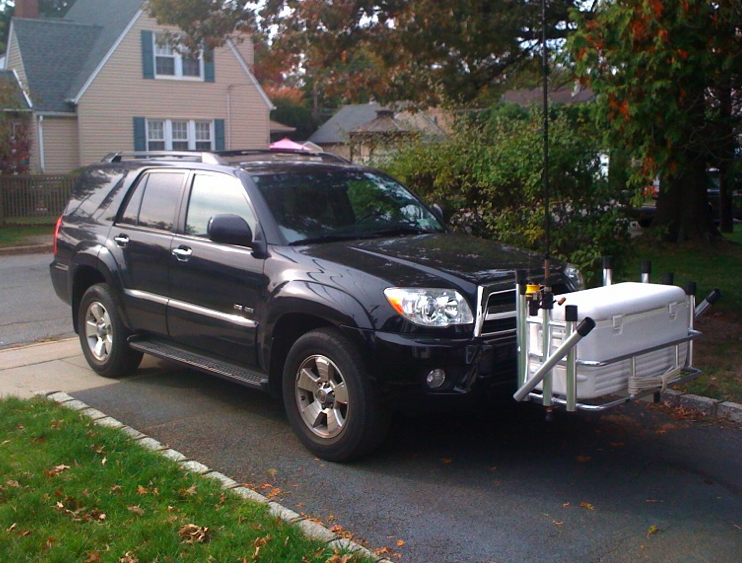 Well my sweet hubby wanted to purchase a cooler rack for his SUV and mission accomplished! Now I'm not normally one for outdoors store, but it was pretty cool. The store was massive and had a restaurant, general store, arcade, shooting range, wildlife displays, massive fish tank and aisles of product! There were huge museum quality displays all through-out the store. They made me a bit sad, because I'm not in love with the idea of hunting, but they were impressive. Our trip to PA and back took up all of our Saturday. Sunday I put the birthday boy to work. Jon continued on his mystery project (It's almost finished) and I did a couple of my own little products. I'm in love! I love how the white dishes help my jewels pop! Can't wait to start wearing something new everyday! What a great feeling to get organized for pennies (ok it was $10) and cross off something off of my to-do list. Did you cross anything off your to-do list this weekend? I moved house (moved in with my boyfriend! ), unpacked 97.5 per cent of my clothes and baked a ginger cake. Great idea, it looks so organized now! 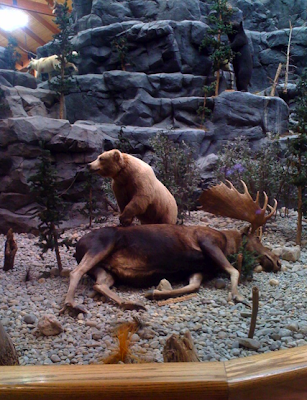 Bass Pro Shop?? It's kinda neat, huh? And I love the organization! I did something similar with mine about a month ago...I love being able to see what I have. Plus, it's fun to look at...like going shopping in your own house! I love the white dishes even better than the Martha china!! Such a good idea! Love me some Christmas tree shop too! OMG, what a great idea! I'm so going to copy you! what did I scratch off my list? Writing my blog posts for the week! I've been MIA for about 2 weeks now! I love this idea and I've been looking for a way to store and organize my jewelry! Can't wait to pick up some of these dishes and try it out! I have bowls from Anthro atop my vanity. Love it! that looks FABULOUS. god I miss christmas tree shoppes. I've been meaning to do the Martha style for a while now too! But yours looks so organized I think I may like your way better! Thanks for sharing! 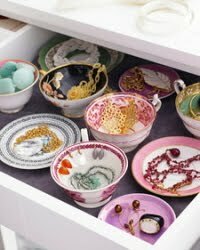 looks so cute love the little dishes in your drawer perfect way to see all your earings etc in such a pretty way! I actually like the white dishes instead of the tea cups, the jewelry seems like its the showcase and doesn't compete with the pretty patterns of the teacup! You made me put on my list go to the Christmas Shoppe this week, I keep meaning to go there! I finished 2 side tables this weekend http://housetoyourhome.com/2010/10/25/another-design-rule-to-follow-never-take-yourself-too-seriously/. Hope you have a great week! That Martha Stewart image is one of my favorites. And your drawer looks great. I might have to do that one day! I accomplished one of my to-dos this weekend as well, which feels great. After years of not knowing what to use for curtains in my master, I finally got down to it and created a shear wall of curtains, which covers 21' of wallspace-I posted pictures of it on my blog and am quite happy with it- only took two days:( but worth it in the end. What a fun weekend! And I LOVE your vanity drawer, aren't you just in love every time you open it? So so pretty, and organized too! what a fabulous organizational idea!! thanks for sharing! I love this! Might have to borrow the idea :) Thanks for the inspiration! LOVE thi idea! My vanity looks just like your before pic. I have so many necklaces jumbled up together that I just wear the same thing all the time. I'm going to copy this idea. I love the white dish jewelry drawer! Great idea. I just turned an old tool box into a jewelry armoire and now it's so fun getting ready in the morning with everything organized in nice drawers. I finally found my office drapery fabric!!!!! Yeah!!! I love that idea for jewlery storage....mine is everywhere! great way to organize!!! love it. Hi! I've been quietly "lurking" for ages now but I had to comment after this post - I LOVE this project! I like your version so much better than Martha's (and I do love me some Martha) because (as a number of other commenters have already said) it DOES showcase the jewelry better than a mish-mash of cups. Plus, it somehow reminds me of a fancy boutique I've been to (not sure exactly which one) where they display the jewelry like this - talk about shopping your own closet every time you get dressed! what fun! I have that same M. Stew picture/article bookmarked too! Like how you got the look for less! i love the white bowl idea. i'm gonna try that, ur jewelry looks so good. like its in its own little boutique. what a cleaver idea. my vanity needs this makeover. Brilliant idea! I LOVE it!! It makes each piece look so beautiful. Camila- Love this idea! So simple and looks just stunning! This weekend we boarded up the hole in the living wall where we knocked down our fireplace. Now just waiting for the contractor to come and make a bigger hole! Oh you have no idea. Pete and I took every last dish and plate and applience out of our butlers pantry and reorganized replete with label maker action...It was very old and very married and honestly pretty lovely! I LOVE this idea!!!!! I want to do it now!